In a shocking turn of events, Ms. Marvel takes the top spot in the Fantasy Comic League power rankings in a week when Spider-Man appears in four books! 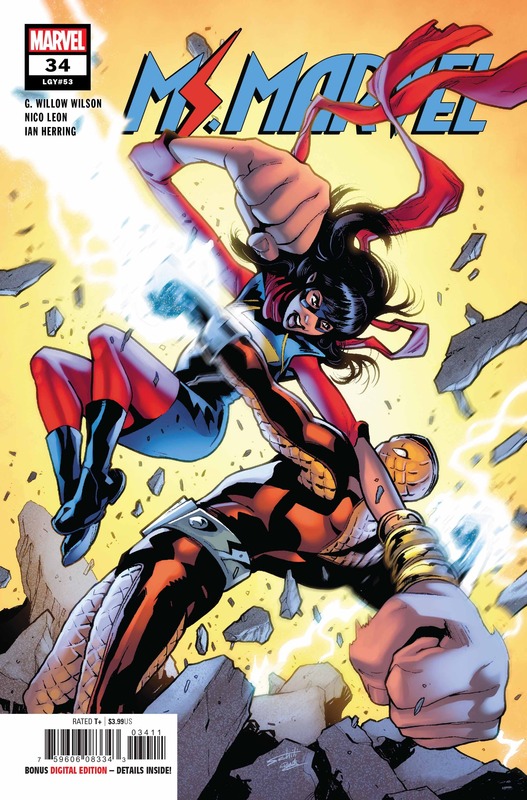 Kamala Khan snags her fourth “Hero of the Week” title with a 14 point performance across three books. Her biggest contribution comes from the finale of the Marvel Rising limited series, in which she leads Squirrel Girl and Ms. America. That book totaled 18 combined points for the three heroines. Captain America also stifles Spider-Man and places second with 13 points. Cap also appears along Squirrel Girl, this time in her own title. The silent issue of Unbeatable Squirrel Girl posts 25 points thanks to a cameos by the Avengers and earns the highest mark for a book in the second week of September. Spider-Man must settle with third place and 12 points. An odd occurrence in a week which saw both his flagship titles, Amazing Spider-Man and Peter Parker: The Spectacular Spider-Man, drop new issues. Squirrel Girl benefits from her two big issues and puts up her best performance of 2018. She scores 11 points and takes fourth place. Black Panther, Domino and Logan split fifth place with seven points apiece in what is shaping up to be a common occurrence for this trio, at least for Dom and the Old Man. Last week Domino and Logan tied with five points, but Black Panther had a slight edge over them but remained close with six points. When it comes to the overall 2018 standings, Black Panther (206, third place) and Logan (205, fourth place) are separated by only one point, but Domino is trailing thanks to a non-existence first four months. Ms. America, the third drafted hero featured in Marvel Rising, has sole possession of eight place with six points. A five-way tie for ninth place rounds out the top performers for the week. Daredevil, Doctor Strange, Iron Man and Marvel Girl are no strangers to the upper echelon, but the five point performance by Karolina Dean helps her accomplice something no other Runaway has done when they have been drafted. Snowguard, another Fantasy Comic League rookie, earns her wings and first points with a two-point performance in the latest Champions.